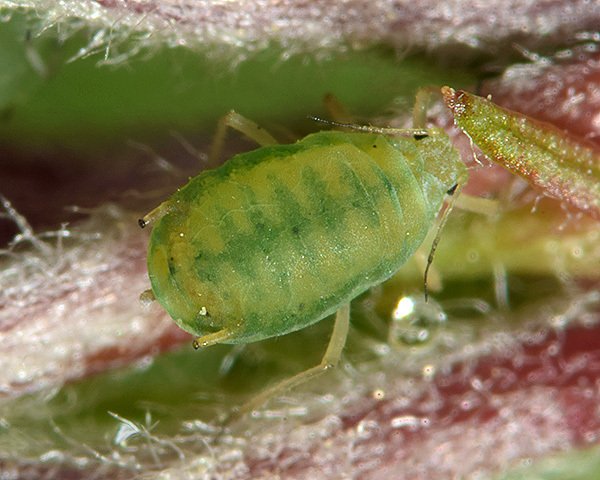 Rhopalosiphum are small to medium-sized aphids with a body that is broadly oval to rather elongate in shape. The dorsal body cuticle is membranous with pigmented patterns confined to small intersegmental muscle sclerites and variably present bands across the pronotum and abdominal tergite 8. Marginal tubercles are normally present on the pronotum and on abdominal segments 1 and 7. The siphunculi are variable in shape - cylindrical, tapering, vasiform or slightly swollen, always with an apical expansion and a strong flange. The cauda is shorter than the siphunculi and bluntly tapering or tongue shaped. There are about 14 species in the Rhopalosiphum genus. Most species are holocyclic over some part of their distribution, but many have anholocyclic populations. Rhopalosiphum species usually host alternate between plum (Prunus spp.) or apple (Pyroideae) as primary hosts and grasses (Poaceae) or sedges (Cyperaceae) as secondary hosts. Rhopalosiphum species may be ant attended and some are important crop pests. Apterae of Rhopalosiphum nymphaeae are brownish on the primary host (plum), and more or less shiny reddish-brown to dark olive on the secondary host (water lily). The dorsal cuticle has reticulation formed by regularly shaped roundish bead-like spinules. The antennae are about 0.6 times the body length. The terminal process of antennal segment VI is about 3-4 times the length of the base of that segment. On the primary host the apical rostral segment (RIV+V) is 1.0-1.1 times longer than the second hind tarsal segment (HTII). On the secondary host RIV+V is 1.15-1.45 times longer than HTII. The siphunculi are more than twice the length of the cauda and are swollen on the distal half. The cauda is elongate and slender. 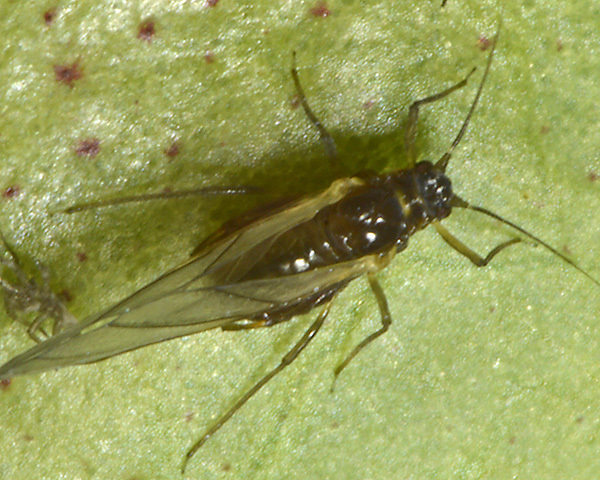 The body length of Rhopalosiphum nymphaeae aptera is 1.6-2.6 mm. Rhopalosiphum nymphaeae alatae (see second picture above) are shining brown, sometimes with white dorsal wax markings. The immatures (and sometimes the adults) may be dusted with a light grey wax on the head, thorax and legs. 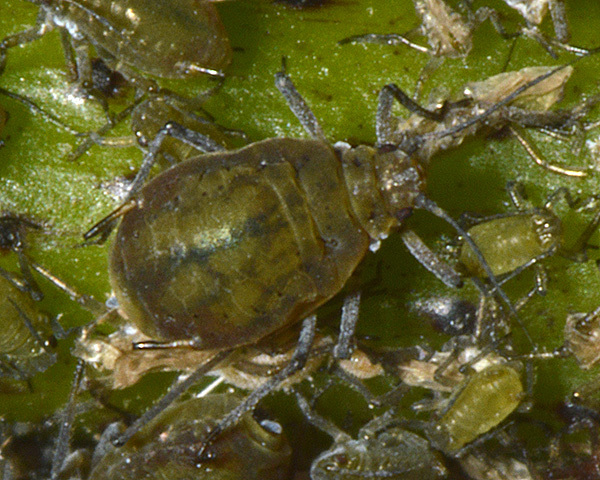 In spring the water lily aphid feeds on various Prunus species (such as Prunus spinosa) where it feeds on leaf petioles and fruit stalks curling the leaves. In early summer Rhopalosiphum nymphaeae alatae migrate to the secondary hosts comprising a large variety of water plants, including Nymphaea (water lilies), Potamogeton (pondweeds), and Sparganium (arrowheads). Its distribution is almost cosmopolitan - in Britain it is found from the south of England to the north of Scotland. Rhopalosiphum oxyacanthae apterae (see first picture below) on apple are small light green to yellow-green aphids that are elongate-oval in shape. They have fairly well-marked dark green stripes down the centre of the back with cross bars and along each side. The 5-segmented antennae are about a third the length of the body. The frontal head tubercles are low, with the median frontal tubercle about the same height as the antennal tubercles. The siphunculi are quite short - about one tenth as long as the body - slightly swollen subapically, and pale with dusky tips. The body length of the adult aptera on the primary host is 2.1-2.6 mm. Winged Rhopalosiphum oxyacanthae viviparae (see second picture above) have a blackish head, thorax and siphunculi and a green abdomen with some brown plates and pigmentation. 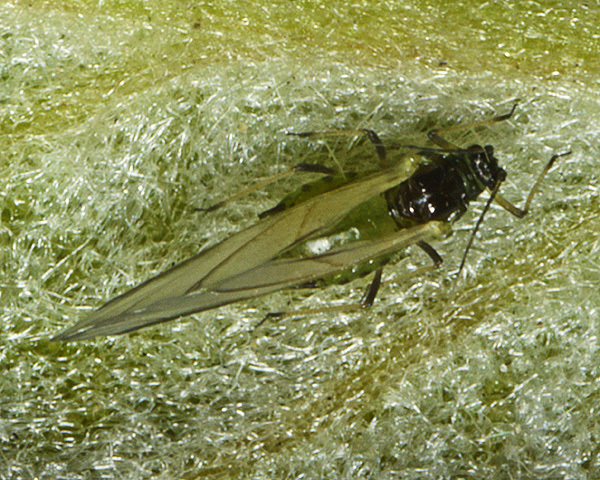 The apple-grass aphid aptera on its secondary host - grass roots - (see first picture below) is pale green, yellowish green or bluish green with no clear markings. The antennae are normally 5-segmented and much shorter than half the body length. The siphunculi are brown, 0.11-0.13 times the body length and nearly twice the length of the cauda. The body length of the apterous adult on the secondary host is 1.1-1.9 mm. 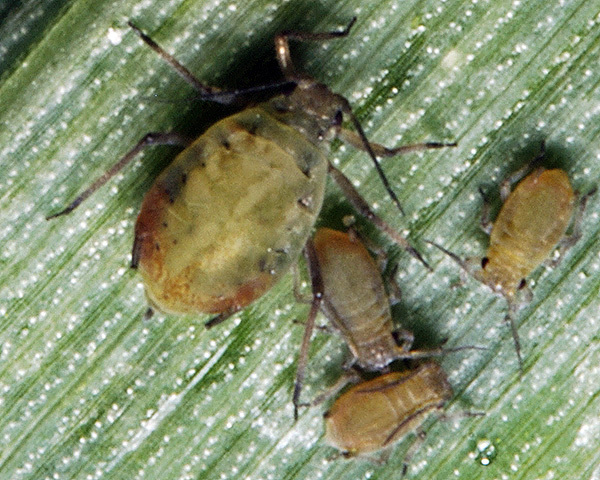 The apple-grass aphid host alternates between apple and related species (Rosaceae: Cotoneaster, Crataegus, Malus, Pyrus, Sorbus) and the roots of various grasses (Poaceae). It has a sexual stage in its life cycle with eggs laid on apple. The first generation in March induces curling perpendicular to the mid-rib of the young leaves of the primary host. Apple-grass aphids may be attended by ants. Winged forms migrate in late May-June to the underground parts of various grasses, but colonies may persist into summer on primary hosts. Rhopalosiphum oxyacanthae is found in Europe and Japan. 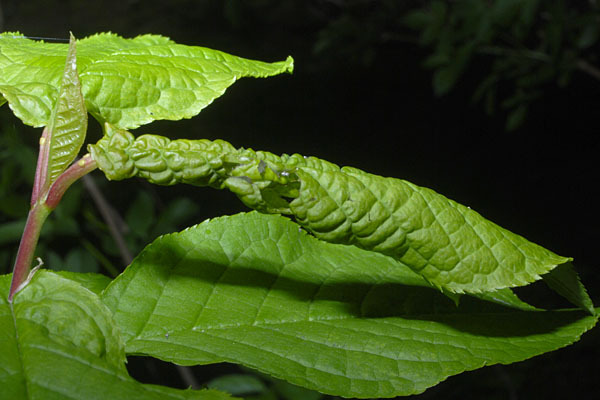 On the primary host (bird cherry) feeding by the fundatrix of Rhopalosiphum padi & her offspring induces a rolled leaf gall (see first picture below). Apterae in the gall have a coating of mealy wax (see second picture below). Apterae on the secondary host (grasses) (see third picture below) are pale green to dark green, brown or nearly black, with a rust-red suffusion around the base of each siphunculus. The terminal process of the sixth antennal segment of the aptera is 3.1-5.2 times as long as the base of that segment. The apical ends of the siphunculi are slightly swollen and end with a strong flange preceded by a distinct constriction. The cauda is rather pale and shorter than the siphunculi. The body length of Rhopalosiphum padi apterae is 1.2-2.4 mm. The alate vivipara of Rhopalosiphum padi is green, with a rusty red suffusion around the siphuncular bases. It has marginal tubercles on most or all of abdominal segments I to VII. The apical rostral segment (RIV+V) is 0.75-0.95 times as long as the second hind tarsal segment (HTII). The longest hairs on antennal segment III are 0.53-0.76 times the basal diameter of that segment. The bird cherry - oat aphid host alternates between bird cherry (Prunus padus) as the primary host and various grasses (Poaceae) as the secondary host. Some populations reproduce parthenogenetically all year on grasses. Rhopalosiphum padi is the principal vector of barley yellow dwarf virus, and has a cosmopolitan distribution. Special thanks to Paul Piron for noting that in an earlier edition of this page we misidentified Rhopalosiphoninus calthae (which also feeds on water plants) as Rhopalosiphum nymphaeae. Stroyan, H.L.G. (1984). 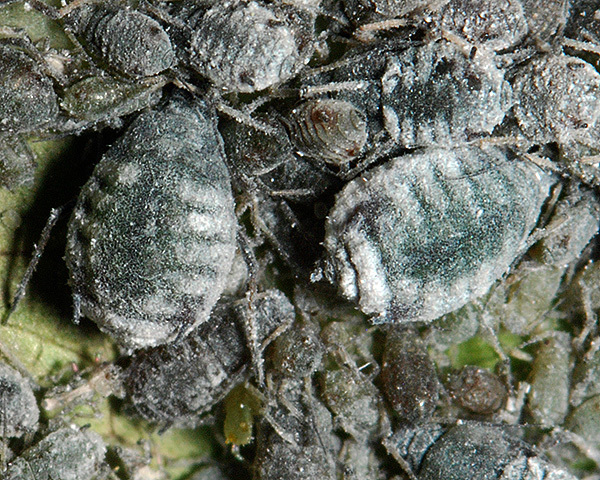 Aphids - Pterocommatinae and Aphidinae (Aphidini). Handbooks for the identification of British insects. 2 (6). Royal Entomological Society of London.